Abcam's CytoPainter Fixable Cell Viability Assay Kit (Fluorometric - Red) (ab176744) is used to evaluate the viability of mammalian cells by flow cytometry. The fluorescent dye provided in the kit is retained in cells by reacting with cellular components. 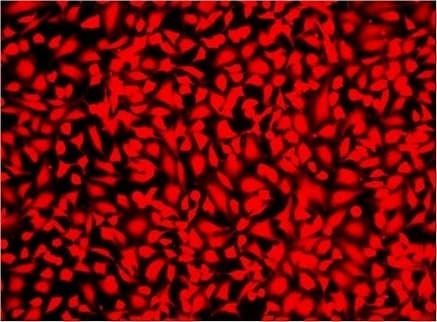 For viable cells, only the cell-surface amines are available to react with the dye while for the necrotic cells or the other cells with compromised membranes, the reactive dye reacts with cell surface amines and intracellular amines, resulting in more intense fluorescent staining. The difference in fluorescence intensity between the live and dead cell populations is ~100-500 fold and can be completely preserved after fixation. 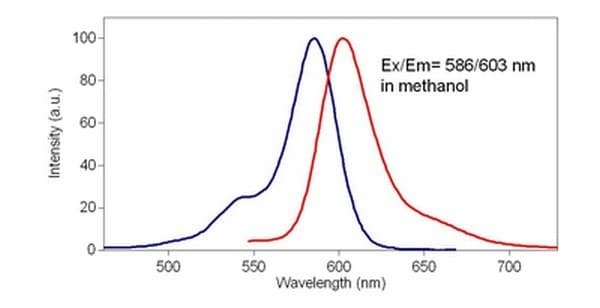 The dye is designed to label cells at Ex/ Em = 583/603 nm. The Excitation source is 561 nm. Cell viability is a determination of living or dead cells, based on a total cell population. Cell viability assess healthy cells in a sample, with no distinction between dividing or quiescent cells. An increase in cell viability indicates cell growth, while a decrease in viability can generally be interpreted as the result of either toxic effects of compounds/agents or suboptimal culture conditions. HeLa cells fixed with formaldehyde and labeled with CytoPainter Fixable Cell Viability Assay Kit (Fluorometric - Red) (ab176744) in a black wall/ clear bottom 96 well plate. Fluorescence spectra properties of ab176744. Publishing research using ab176744? Please let us know so that we can cite the reference in this datasheet. There are currently no Customer reviews or Questions for ab176744.